The Legends series has always been known for its unique airship design style. Most of the crafts seem to resemble huge fish (or birds, in the case of the birdbots), with large, "fin-like" wings sticking out from the sides and circular, red/green windows on the front that look like fish eyes. They're also generally on the bulky side. It's a very distinct style, one that's undoubtedly made its mark on so many who have played the Legends games; therefore, we thought it'd be fun to have our supporters try to re-capture this style, in as unique a way as possible, by designing and submitting their own Legends airships! The wide-array of airships in the Legends universe were definitely a huge part of what made the series so interesting; as a result, we hope all of you do your best to come up with some genuine-looking, yet unique designs, and maintain the superb level of imagination that this series is known for! - Participants are allowed to work in groups, but only one member of the group will be able to receive a prize. - Entries must include at least one image of the submitted airship. Drawings, 3D models, and digital art are all accepted options. For this contest, we will not be accepting text-only submissions. - Participants are allowed to revise their entries until the cutoff date for the contest (just use the "Edit" button on your post if you want to change anything). This one's for your long-term travel and lodging needs. If you're a member of a larger family or digging team, you'll find everything you need to take your home to the skies full-time with the Borealis. This hefty airship boasts up to six bedrooms, two bathrooms, a kitchen, and a common area along with the standard airship fare--bridge, engine room, you know the drill here. Have I mentioned it has a two-level deck outside? That planking is 100% weather resistant. The engineers at Gallanton are all about giving their all and with the Borealis, it sure shows. This event officially concludes on May 4, so you all have an entire month to come up with some amazing airship designs! Airship designs will be judged on two primary factors: Suitability for the Legends series, and uniqueness of concept. Finding the perfect balance between both these elements may prove rather difficult, but we think the challenge will be half the fun of it! To get a good idea of some distinct traits in Legends airships, see the introductory paragraph in this post. You may also refer to some of the screenshots we've provided below if you choose (courtesy of Legends-Station). It may also bear mentioning that, unlike past Neo Devroom events we've held, the final contest winners of this event will be determined by the contest judges, instead of a poll. Images: Flutter, Gesellschaft, Sulpher Bottom, KTOX TV Reporter Airship, Drache, Glydon, Dorado, Fokkerwolf, Mutti, Rafale. - A copy of the Mega Man NT Warrior Volume 2 DVD, signed by several key members of the English dub and, most importantly, the legendary Keiji Inafune himself! 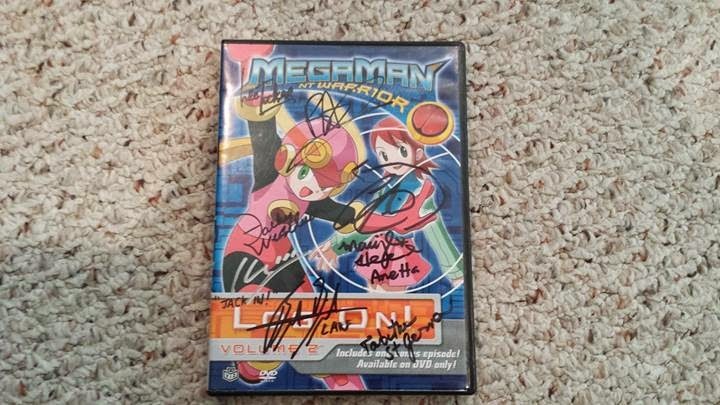 The signatures include Brian Drummond (Heatman EXE, Skullman EXE, Whaleman EXE, Snakeman EXE, Moltanicman EXE), Maryke Hendrikse (Anetta), Cathy Weseluck (Kid Grave), Brad Swaile (Lan), Andrew Francis (Megaman.EXE), Tabitha St. Germain (Maddy), Lee Tockar (Higsby, WoodMan), and, of course, Keiji Inafune (in the silver ink). That's 8 total! - A Get Me Off The Moon T-shirt, with the official 100k Strong logo on the front and the "Mega Man Legends 3" logo on the back. XL size. - A Mega Man fan-art book created by one of our exceedingly talented artists, Ancode. 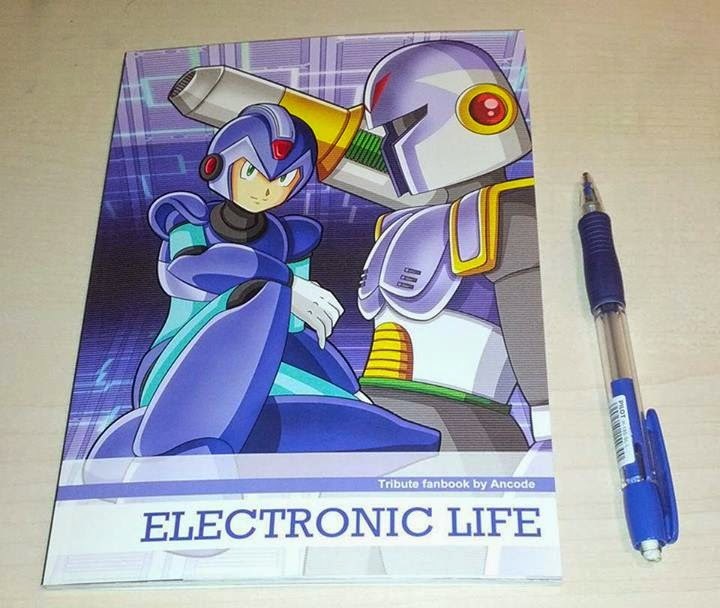 The art book is entitled "ELECTRONIC LIFE" and contains 71 pages of artwork from the various Mega Man series'. 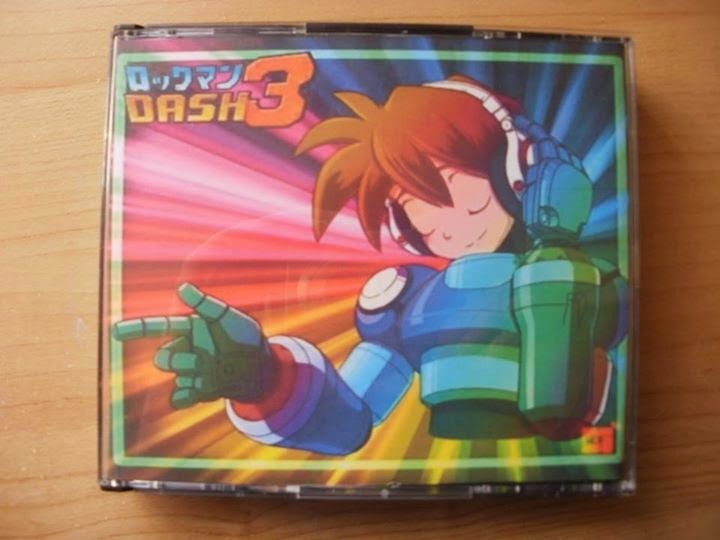 - A set of five Mega Man Legends 3 postcards. These were given away by Rockman_Unity around the time Legends 3 was still in development, so they're quite special! 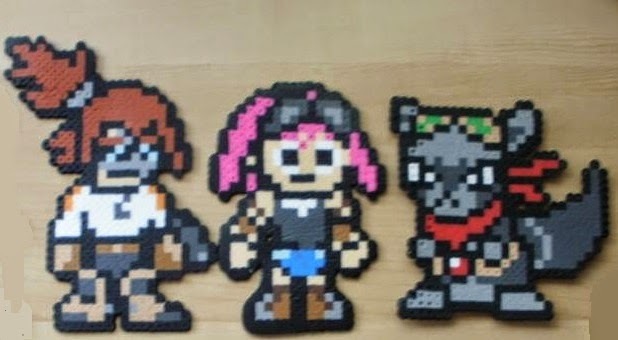 - A set of three Mega Man Legends 3 bead sprites (Barrett, Aero and Tinker, to be precise), courtesy of Ryan King. For complete rules and details, visit the Get Me Off The Moon Facebook page here, and join in their discussion on Capcom Unity here, and finally, submit your design(s) here. Hey Protodude, there's a Smash Bros Direct confirmed for Tuesday. Meaning there's a good chance we'll see more of how Megaman plays, how his stage works and what songs play on it, and also what his assist trophy will be. It's been so long, I actually forgot this even existed.